If you'd like to get in touch with the School of Mechanical, Industrial, and Manufacturing Engineering about a Capstone Project, please use our online webform to introduce us to your project. 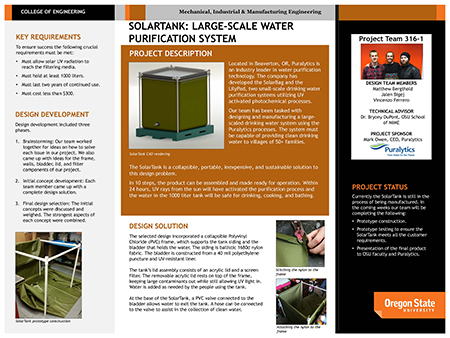 Download a brochure [PDF] about our program, or return to the Capstone Project overview page. Go Baby Go Ball-Throwing Devices: "Throw-Baby-Throw" and "Go Baby Cannon"
In partnership with the College of Public Health and Human Sciences, and Dr. Sam Logan, two School of MIME student Capstone teams have modified two child-sized ride-on cars with a ball-thrower device. These vehicles are modified toy electric cars to support the mobility of children with such disabilities that cause mobility issues. 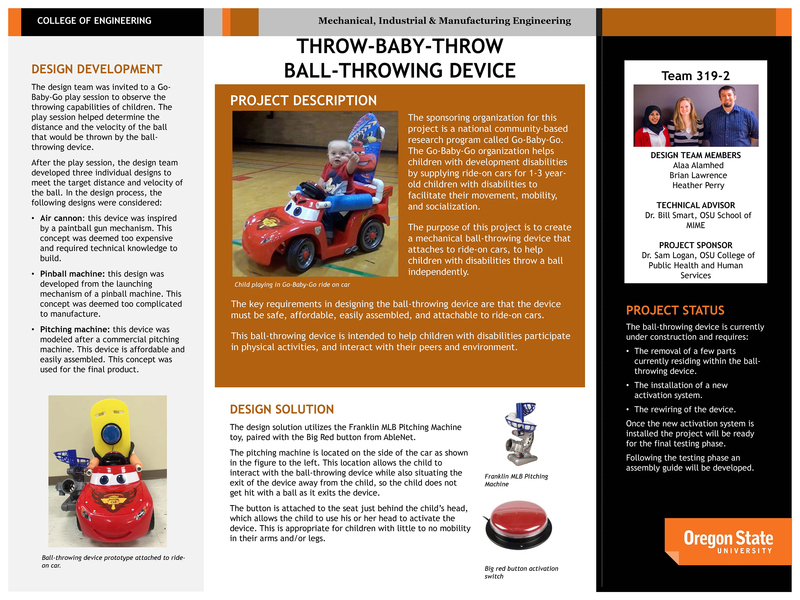 The throwing devices allow a greater level of interaction with other children in play and educational settings. This team of engineering senoirs is refining the solar-powered water purifying system developed by Portland startup, Puralytics. The aim of this company is to contribute to the solutions for global clean water. The School of MIME Capstone team has been tasked with designing and manufacturing a large-scaled drinking water system using the Puralytics processes. The system must be capable of providing clean drinking water to villages of 50+ families. The SolarTank is a collapsible, portable, inexpensive, and sustainable solution to this design problem. In 10 steps, the product can be assembled and made ready for operation. Within 24 hours, UV rays from the sun will have activated the purification process and the water in the 1,000-liter tank will be safe for drinking, cooking, and bathing. EarthCruiser manufactures mobile adventure homes that literally cruise around the world and thus need to be all-terrain vehicles as well as self-sufficient up to 15 days. The EarthCruiser vehicle is equipped with a photovoltaic (PV) solar power panels attached directly to the roof to generate electricity. The Energy Systems Engineering (ESE) Capstone team improved the energy efficiency of these existing photovoltaic panels by designing and prototyping a system to tilt the panels to optimize the tilt with respect to the angle to the sun and cool the panels with convectional heat transfer. Testing of the prototype yielded about 5 percent improvement in energy efficiency. The company’s U.S. facility is located in Bend, Oregon. The Science and Math Investigative Learning Experiences (SMILE) program is a pre-college program for middle school and high school students that aims to raise awareness in science, technology, engineering and mathematics in order to prepare students for academic success. 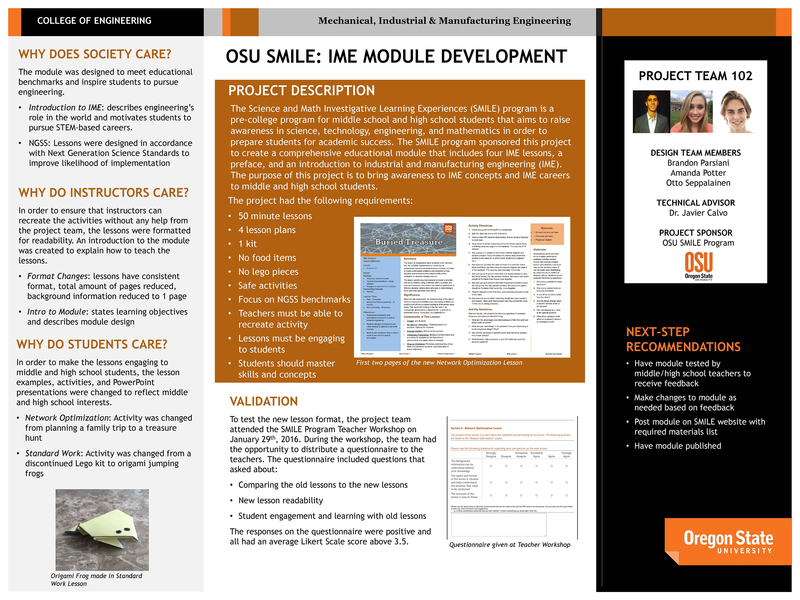 The SMILE program sponsored this Scool of MIME Capstone team to create a comprehensive educational module to introduce industrial and manufacturing engineering to the students. The SMILE kit they are developing includes a "treasure hunt" and origami jumping frogs to bring the lessons to the student groups. So far, feedback from students and teaches has all been positive. 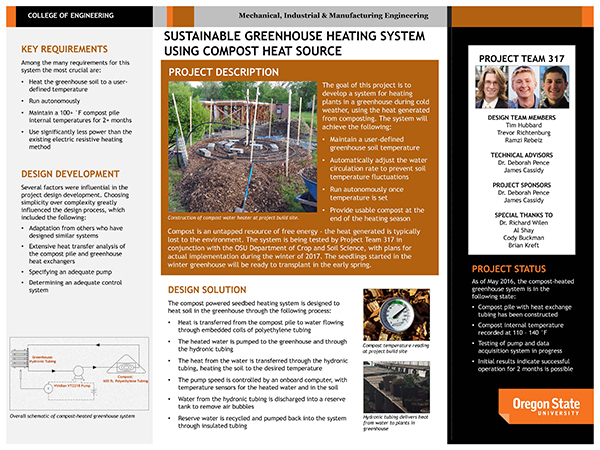 The goal of this School of MIME capstone design project is to develop a system for heating plants in a greenhouse during cold weather, using the heat generated from composting. Compost is an untapped resource of free energy - the heat generated is typically lost to the environment. The system is being tested by the project team in conjunction with the OSU Department of Crop and Soil Science, with plans for actual implementation during the winter of 2017. The seedlings started in the winter greenhouse will be ready to transplant in the early spring. The system is expected to: maintain a user-defined greenhouse soil temperature; automatically adjust the water circulation rate to prevent soil temperature fluctuations; run autonomously once temperature is set; provide usable compost at the end of the heating season. The system has the potential to improve small-scale agricultural output globally. 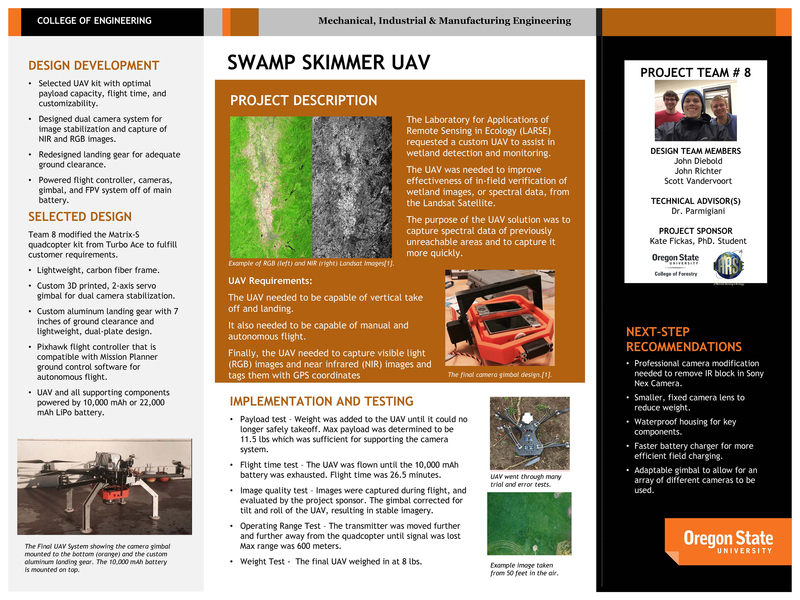 Working collaboratively with faculty from the College of Forestry, a team of senior engineering undergraduates from the OSU School of Mechanical, Industrial and Manufacturing Engineering’s capstone design program to build an unmanned aerial vehicle (UAV) -- ‘The Swamp Skimmer’ -- for wetland monitoring. The engineers assembled the vertical take-off and landing quad-copter from parts, designed and 3-D printed a custom gimbal for the UAV’s two-sensor system, and hand-machined innovative aluminum landing gear. The Swamp Skimmer will be used to help validate wetland classifications of Landsat satellite imagery across the United States as well as monitor spatio-temporal dynamics of restored wetlands at fine temporal and spatial resolutions. This design project was tasked with designing an economically feasible energy storage plant that would allow Energy Northwest to capitalize on stored excess energy by regenerating electricity to meet customer loads during high demand periods. This project researches the feasibility of a hydrolysis energy storage plant which uses electrolysers to convert excess energy from Columbia Generating Station and Nine Canyon Wind Project to into hydrogen gas which can be stored. Hydro Flask, a Bend, Oregon-based company producing drink containers, sought to improve the functionality of its existing vacuum-sealed bottles. The key design constraints set by the sponsor included: complying with all food and beverage compliance standards, additional cost of less than $0.50 per flask, the materials used be environmentally friendly and 100% recyclable, adherence to cradle-to-cradle design principles, and that no significant dimensional changes to product shape or brand image be made. Operations at the 49-acre Hatfield Marine Science Center (HMSC) research facility in Newport, Oregon, are heavily dependent on the seawater supply. The focus of this project is to optimize the overall efficiency of the seawater pumping system by eliminating overpumping. The most advantageous design, Variable frequency drives (VFD), were chosen to be incorporated on the intake and distribution pump motors. The implementation of this design is minimally invasive, requiring no changes to the existing infrastructure beyond the addition of the stated equipment. The OSU Energy Systems Laboratory and its spin-off company Onboard Dynamics, Inc. (ObDI) are developing a self-service refueling NG engine. This ObDI technology will allow consumers to refill their vehicle at home with low cost, low pressure, residential NG. This project will develop an intelligent energy management/monitoring touch screen human machine interface (HMI) prototype for the vehicle. The Sope Press is an industrial grade sope maker, allowing Del Corazon to create a micro-business selling sopes, a traditional Mexican dish similar to a tortilla, filling a current void in a growing market. The cooperative between OSU and Del Corazon enables a startup company to grow and expand. The current design will allow Del Corazon to start their business selling sopes to First Alternative Co-op and other local markets. The Laboratory for Robotics and Applied Mechanics (LRAM) at Oregon State is investigating robotic throwing with a projectile that is attached with a tether to both manipulate flight dynamics as well as facilitate automatic projectile retrieval. To explore the effects of a non-rigid throwing arm, our group was tasked with creating an arm that would provide varying stiffness levels for repeatable experimentation. Ultimately, the lab hopes to be able apply the findings to search and rescue robots or any number of yet-to-be-discovered possibilities. The purpose of this project was to design and build a testing apparatus that would aid OSU’s Laser Flow Diagnostics Lab in studying how energy can be harvested from a moving fluid. The testing apparatus was designed to: 1.) Actively induce an oscillatory heaving and pitching motion in a hydrofoil with a passively actuated leading and trailing edge; and 2.) Measure the lift and drag forces acting on the hydrofoil.The hope is that this hydrofoil design, inspired by fish and insect flight, will provided a viable, low-impact, high-efficiency source of energy. In order to study the effects of global temperature change on migratory birds, a device that is capable of simulating climate change is desired. Our nesting device for house wrens will: 1.) raise the ambient nest-box temperature simulating climate change; 2.) track outside ambient temperature as a reference datum, and 3.) measure and record temperature data. With this we will study how the warming trend affects migratory bird species. There are several arenas in which conventional vehicle traction is in need of improvement; examples include robotics, military, and competitive off-road arenas. Stuck military vehicles can cause a break in supply lines or leave personnel stranded in dangerous areas. Improved traction can also provide a significant performance advantage to competitive off-road vehicles. The Mars rover named Spirit became irreversibly stuck at a very high cost; the robot would have benefitted from improved traction. 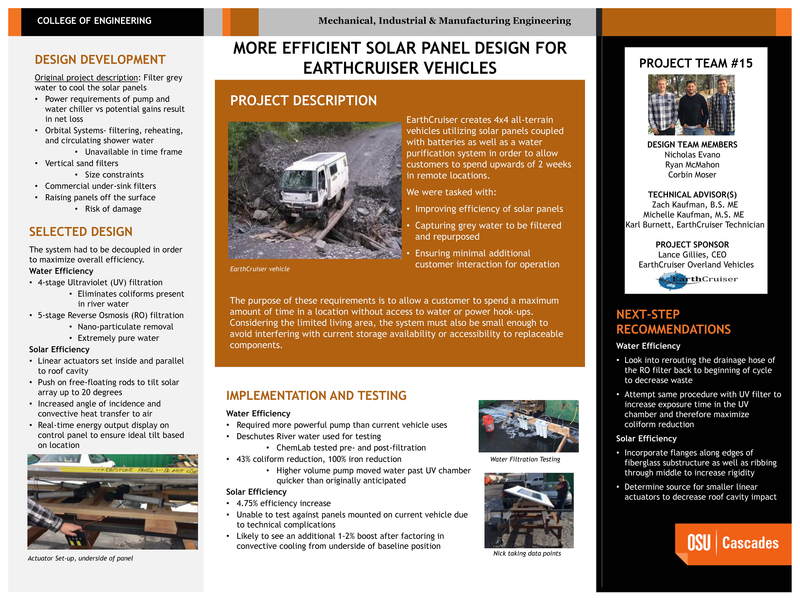 Some of the current limitations of a typical off-road vehicle’s traction can be attributed to its passive suspension system; this project will employ an active suspension to remedy these limitations. Current passive suspension systems only provide vehicle compliance to terrain with a weight difference between wheels. This Capstone Project involves the design and manufacture of a 2 degree-of-freedom (DOF) foot for ATRIAS, a walking, running, and jumping bipedal robot designed and built in the Dynamic Robotics Lab (DRL) at Oregon State University with funding from DARPA and the Human Frontier Science Program (HFSP). The robot currently uses a point toe similar to the end of a pogo stick instead of a full-form foot. The new foot will allow ATRIAS to run in three dimensions by resisting twisting forces and reducing impact chatter, giving the robot firm landings and take-offs for the no-slip condition required by the controllers. The Dynamic Robotics Laboratory (DRL) at OSU designs and builds bipedal robots and is building a straight track for these robots to “walk” on. To prevent damage to these walking robots, an overhead gantry crane, whose glider autonomously travels above the robots and catches them when they fall, is needed. The purpose of this project is to design and build that gantry system. Computer numerically controlled (CNC) machining enables users to machine complex parts with relative ease, using a combination of three-dimensional modeling software and a motor controlled machine mill. The OSU Mechanical, Industrial and Manufacturing Engineering (MIME) Machining and Product Realization Lab (MPRL) owns multiple CNC machines for student use. One of these, however, was a Bridgeport EZ Trak CNC machine with the ability to control two axes. The CNC functions were non-operational and required a complete upgrade including a new control system, a new human interface device, and a mechanism to control the Z-axis. In this project we designed a DAQ (Data Acquisition Buoy) buoy to gather ocean environment information and transmit data for less than $200 for the Northwest National Marine Renewable Energy Center (NNMREC) for their research into wave energy converters (WEC). The team focused on the WEC using internal pendulum, converting potential energy into stored electrical energy, and collecting data on the direction, amplitude, and speed of incoming waves. 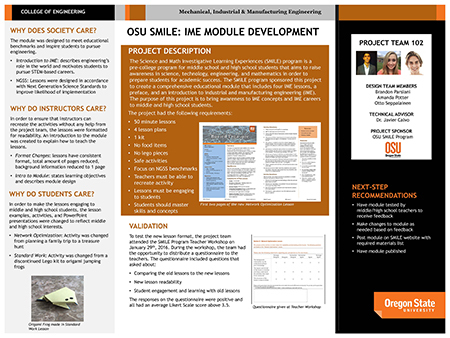 The SMILE program is a precollege program at Oregon State University which supports K-12 schools around Oregon State by introducing STEM-based activities. Inspired by the Portland Aerial Tram the SMILE program decided an interactive cable propelled transport system would be a great way to demonstrate several key concepts of engineering. We built a portable, interactive, cable propelled transport system for the SMILE program to bring to events and challenges with the hope that it will be a new and unique way to introduce young students to not only the concepts presented by the device, but the engineering process as a whole. The device will be accompanied by a series of videos. The 2014 Sample Return Robot Challenge (SSRC), held by the Worcester Polytechnic Institute and NASA, promotes advancement of search and retrieval for technologies for autonomous robotics. As a participant in this competition, OSU Robotics Club’s Rover Team will need a rover capable of autonomously navigating an unknown terrain while locating, obtaining, and returning a variety of randomly placed samples. The purpose of this project was to create the arm and storage system for the 2014 OSU SRRC robot. This system needed the ability to grasp and store ten different objects while costing no more than $1000. Oregon State’s Laboratory for Robotics and Applied Mechanics (LRAM) is seeking a set of shock absorbing couplers for a casting manipulation robot. The development of this robot allows research into methods for implementing accurate casting devices on mobile robots, and vehicles. The goal of this engineering project is to design an implant that fits within the forearm of an average sized person to allow for the fingers to firmly grasp and move fluidly while grabbing an asymmetric object. The concept design will be used in patients who have experienced high median ulnar nerve palsy. Damage to these nerves reduces the function of rotating and grasping of the hand. This project involves the creation of a robot prototype based on Arti_1, a proof-of-concept robot. Invented and patented by Andrew Ferguson, the project sponsor and mentor, Arti is intended to address the problem of telepresence. There are several telepresence robots in the marketplace, but these cannot climb stairs, and must rely on flat flooring. Arti is intended to possess the ability to climb stairs, one of the main obstacles for telepresence robots. This project seeks to address the dietary crisis our society is faced with today, and how the inclusion of whole-grain nutrition is important in leading a healthy lifestyle. This will be accomplished through the teaching and sharing of proper dietary practices to influence users’ dietary decisions in a positive manner. In order to make this learning opportunity fun and engaging the sponsor, Moore Family Center for Whole Grain Food and Halsey Ostergaard, has commissioned us to create a Human-Powered Flour Mill (HPFM) for use at various educational-based health events. This device will serve not only to pique the interest of event participants but also to produce enough flour by the end of the event to make a pancake. The Oregon Climate Change Research Institute (OCCRI), created in 2007, is a collection of researchers within the Oregon University System that gather climate information that will be eventually presented to the public. One measurement that OCCRI is currently trying to measure is the mass of a tree over time. There are a variety of applications that can use this information, from regional variations of budding dates to precipitation absorption rates for different tree species. The new method of measuring the mass is by placing an accelerometer device on the trunk of the tree to find the tree’s natural frequency, which then can be used to estimate the tree’s mass. The zebrafish embryo sorting project was developed to address the issue of creating an effective and efficient sorting system for the Sinnhuber Aquatic Research Laboratory (SARL). In the research of toxicology, zebrafish have been adopted as the ideal testing model given their speed of reproduction and their DNA composition similar to that of humans. Zebrafish embryos are transparent and grow quickly, allowing for scientists to observe test effects on the organisms over the embryonic and early growth stages. However, the procedure to sort and prepare individual embryos is a manually extensive operation requiring a large amount of time. The Experimental Sounding Rocketry Association’s Intercollegiate Rocketry Engineering Competition (ESRA IREC) is an opportunity for Oregon State University to show its ability to produce aerospace engineers on par with other schools on an international scale. In ESRA’s Intercollegiate Rocket Engineering Competition (IREC), teams of college students design and build rockets to carry a 10-lb payload to 10,000 feet in the Basic category or to 25,000 feet in the Advanced category. As first-year entrants, Oregon State could compete only in the Basic category, but they won the event. This project was sponsored by Bauer Labs with the goal of developing a unified medical instrument (UMI) for use by physicians, nurses, and other healthcare providers conducting routine patient checkups. The end-purpose is to reduce the number of medical peripherals required to do a standard checkup, which will allow healthcare providers to be more mobile, especially in areas of poverty. In addition to the medical device requirements, the UMI was required to be built around an iOS or Android platform to allow simple replacement of the main processor, increase the usability of the device, and ensure the device is hand-held. There are many different models of LTLMs (Laser Target Locator Module). The primary ones in use by the Army are the TRIGR, the Vector 21, and MKVIIE. Standard military operating procedures call for every FO to be extensively familiarized with one of these models. The difficulty arises once the FO is in the field; he may be given a different model than the one used for training. This causes confusion because the LTLM devices operate, look, and feel differently, and the learning curves on each are steep. When an FO has to take the time to figure out a new device in the field he is exposed longer. To solve this safety hazard the Army wants a prototype to take to manufacturers and demonstrate ideal user interface designs. The US Army has asked us to design and build such an emulator. The Devers Eye Institute has requested that we develop a completely new eye drop adherence monitor that will fit any bottle, accurately record when patients take medication, and have the ability to transfer data to physicians via a wireless network. Upon completion, our eye drop adherence monitor will help patients abide by their treatment plan with timely reminders, and it will allow physicians to see how well their patients are adhering to medication regimens and accurately determine if prescribed medications are acting effectively. This project has the potential to help reduce blindness caused by glaucoma related optic nerve damage. Oregon Freeze Dry (OFD), located in Albany, OR, a manufacturer of freeze dried goods, wanted to cut in half the time required for a changeover. To reduce changeover time, our team improved the sequence of the changeover process and provided standardized work instructions of the improved process. Our team also provided OFD with a Job Aid, a standardized set of work instructions for operators to reference during changeovers. As defined by the dictionary from isixsigma.com, standard work is a detailed definition of the most efficient method to produce a product (or perform a service) at a balanced flow to achieve a desired output rate. In the electronics manufacturing industry, for example, making good, clear, and detailed instructions with proper sequencing is extremely important to create circuit boards with high quality. This project uses Lego building blocks to instruct students on the manufacturing variables and processes, in order to find the correct and fastest possible sequences without sacrificing quality. The Samaritan Regional Wellness Center, the mental healthcare unit of the Good Samaritan Regional Medical Center, worked with a Capstone team to improve work flow. The team chose the CX Lean tool and supporting techniques. The tool provides a way to analyze the daily tasks of the staff in order to look for an improvement in an area of need. It was also decided that a visual management system would help organize information such as treatment team assignments, shifts, duties, and regulations for use by the staff. Oregon Department of Transportation (ODOT) wanted a standard on how to properly change out the snow signs located throughout Oregon. The purpose of this project was to create a safe, efficient, and standardized system for sign-changing. The snow signs are located on the side of the road and display caution warnings to motorists. This project created the proper procedures to establish greater safety protocols for maintenance, and created training and check steps for users to ensure a higher safety standard. This project concerns the manufacturing process of Sheldon Manufacturing Inc., a lab equipment manufacturer located in Cornelius, Oregon. The purpose of this project was to create an express line for a group of Sheldon’s high-running product models. The main requirement of the project was for the express line to reduce by roughly 66 percent the lead time of these particular models. Our team turned its focus to collecting and analyzing data for the chosen models, identified problem areas in the process and located areas for possible lead time reduction. This will allow us to provide Sheldon with the steps to reaching a solution that would aid in reaching their manufacturing goals.